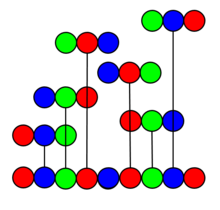 The distribution of permutations in a 3 symbol superpermutation. In combinatorial mathematics, a superpermutation on n symbols is a string that contains each permutation of n symbols as a substring. While trivial superpermutations can simply be made up of every permutation listed together, superpermutations can also be shorter (except for the trivial case of n = 1) because overlap is allowed. For instance, in the case of n = 2, the superpermutation 1221 contains all possible permutations (12 and 21), but the shorter string 121 also contains both permutations. For the cases of n > 5, a smallest superpermutation has not yet been proved nor a pattern to find them, but lower and upper bounds for them have been found. A diagram of the creation of a superpermutation with 3 symbols from a superpermutation with 2 symbols. is split into its individual permutations in the order of how they appeared in the superpermutation. Each of those permutation are then placed next to a copy of themselves with an nth symbol added in between the two copies. Finally, each resulting structure is placed next to each other and all adjacent identical symbols are merged. For example, a superpermutation of order 3 can be created from one with 2 symbols; starting with the superpermutation 121 and splitting it up into the permutations 12 and 21,the permutations are copied and placed as 12312 and 21321. They are placed together to create 1231221321, and the identical adjacent 2s in the middle are merged to create 123121321, which is indeed a superpermutation of order 3. This algorithm results in the shortest possible superpermutation for all n less than or equal to 5, but becomes increasingly longer than the shortest possible as n increase beyond that. was found using a computer search on this method by Robin Houston. An algorithm for finding the smallest superpermutation for 6 or more symbols is as of yet unsolved. However, several proofs have gradually shrunk the strong upper and lower bounds of the problem over time. In September 2011, an anonymous poster of the internet imageboard 4chan proved that the smallest superpermutation on n symbols (n ≥ 2) has at least length n! + (n−1)! + (n−2)! + n − 3. The problem was presented on the forum as "The Haruhi Problem", in reference to the Japanese anime series The Melancholy of Haruhi Suzumiya: if you wanted to watch the 14 episodes of the first season of the series in every possible order, what would be the shortest string of episodes you would need to watch? The proof for this lower bound came to the general public interest in October 2018, after mathematician and computer scientist Robin Houston tweeted about it. On 25 October 2018, Robin Houston, Jay Pantone, and Vince Vatter posted a refined version of this proof in OEIS. For 'The Haruhi Problem' specifically (the case for 14 symbols), the lower bound is currently at least 93,884,313,611, and the upper bound is at most 93,924,230,411. On 20 October 2018, by adapting a construction by Aaron Williams for constructing Hamiltonian paths through the Cayley graph of the symmetric group, Greg Egan devised an algorithm to produce superpermutations of length n! + (n−1)! + (n−2)! + (n−3)! + n − 3. Up to 2018, these were the smallest superpermutations known for n ≥ 7. However, on 1 February 2019, Bogdan Coanda announced that he had found a superpermutation for n=7 of length 5907, or (n! + (n−1)! + (n−2)! + (n−3)! + n − 3) − 1, which was a new record. On 27 February 2019, using ideas developed by Robin Houston, Egan produced a superpermutation for n = 7 of length 5906. Whether similar shorter superpermutations also exist for values of n > 7 remains an open question. ^ Nathaniel Johnston. (2013). Non-Uniqueness of Minimal Superpermutations. Retrieved 28 January, 2019. ^ a b c d Egan, Greg (20 October 2018). "Superpermutations". Retrieved 27 October 2018. ^ Robin Houston. (2014). "Tackling the Minimal Superpermutation Problem." Retrieved 29 January 2019. ^ Anonymous (17 September 2011). "Permutations Thread III". Warosu, a 4chan archive. Retrieved 27 October 2018. ^ Griggs, Mary Beth. "An anonymous 4chan post could help solve a 25-year-old math mystery". The Verge. ^ Houston, Robin. "A curious situation. The best known lower bound... (1054637891085918209)". Twitter. Retrieved 27 October 2018. ^ Anonymous 4chan poster; Houston, Robin; Pantone, Jay; Vatter, Vince (October 25, 2018). "A lower bound on the length of the shortest superpattern" (PDF). OEIS. Retrieved 27 October 2018. ^ Aaron, Williams. "Hamiltonicity of the Cayley Digraph on the Symmetric Group Generated by σ = (1 2 ... n) and τ = (1 2)". arXiv:1307.2549v3. ^ a b Egan, Greg. "Superpermutations". Retrieved 2 February 2019. Grime, James. "Superpermutations - Numberphile" (video). YouTube. Brady Haran. Retrieved 1 February 2018.